Posted by jeremyliew in business models, economics, game design, game mechanics, games, games 2.0, gaming, mmorpg, virtual goods. Siqi Chen, CEO of Serious Business (publisher of the Friends for Sale game), pointed me to an excellent white paper on the money supply impacts on an online economy recently. Consumables are important in creating new Cash – If large amounts of new cash can be created without consumables, then there is no economic brake on cash creation. Players set the prices of Consumable – This is the other side of the coin, since only player set prices can legitimately respond to changes in the money supply. Attempting to do this programmatically in such a diverse economy as a typical MMO is to invite failure. National governments have not been able to do this. Fixed drains need to be in place – This provides a mechanism to remove a Crafter who is economically irrational from the business game, as well as to provide equilibrium in prices and money supply. Thus a regular fixed cash fee for doing business is required, and set by the game. Variable Drains via percentage commission of the sale need to be in place – This provides a damper that mitigates wild swings in the money supply. Fictionally Sales commissions provide this damper. The percentage is set by the game, on Facility Type basis. People building social games should read the whole thing. Posted by jeremyliew in economics, game design, game mechanics, mmorpg, virtual goods, virtual worlds. Scientific American has an overview of how some MMOGs manage their economies (found via Massively). The new player who isn’t able to succeed roams around space trying to make ISK[s]. He tries to be a player-versus-player pilot and loses in battle. He needs help to succeed in the community. Players themselves have found ways to deal with this by creating corporations and alliances. It’s not just economics, but also socioeconomics in general. For new game designers, keeping virtual economies in check is a non obvious but extremely important element of game design. While most designers spend a lot of time thinking about how to add money into a system and how to price virtual goods, some do not spend enough time thinking about how to balance these two elements. If you allow users to transfer virtual currency between each other, trade in virtual items will emerge. If the economies are unbalanced, you run the risk of side effects such as inflation in pricing of virtual goods or too many “high power” items in the wild. Both of these can make it hard for a new player to join the game after it has been ongoing for a while as they are either too poor or too weak to be able to do anything fun. While these things can be managed after they become problems, it is better to have spent some time thinking through the issues before launch. Posted by jeremyliew in business models, economics, games, games 2.0, gaming, mmorpg, subscription, virtual goods. However, I think that we’ll see the free-to-play model (monetizing through virtual goods and advertising) increasingly take share over the next few years and eventually become dominant. In the last 18 months we’ve seen many more free-to-play MMOGs being launched in the West, joining pioneers like Runescape. K2 Network, IGG, Acclaim, Aeria and others have all come to market with westernized versions of asian MMOGs, and all are employing a free to play model. Other companies like Sparkplay and Conduit Labs are building their own free to play MMOGs for the western market. But this flood of MMOGs is not the cause of the increasing dominance of the free to play model, but rather the symptom of the underlying economics of the business. Marginal cost pricing is the principle that the market will, over time, cause goods to be sold at their marginal cost of production. MMOGs, like all other software businesses, have effectively a zero marginal cost of production. This is particularly true when distribution is also online. As a result, you would expect that over time, prices will tend towards zero, i.e. a free to play model. Anti spyware software used to be a premium service, and now it too is mostly free. Anti-virus software is the same story. And parental controls software. Now all are available for free. In each case, it took a few years for the move from premium service to free, but in each case the marginal cost pricing principle eventually took hold. It is hard to hold the line against the invisible hand of the market. 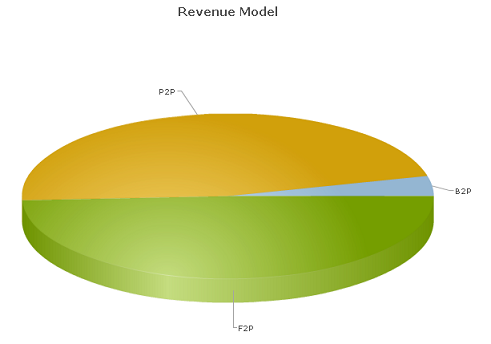 MMOG publishers and developers should be factoring in a free to play environment into their business models. Posted by jeremyliew in economics, gaming, mmorpg, virtual worlds. EVE consists of more than 5000 solar systems in 64 regions. The solar systems are connected in a complex web allowing for goods to be moved from one end in the Universe to another. Pilots have to be careful because in low sec and zero-zero security zones there is always the danger of being attacked by gangs of pirates looking for easy prey…. EVE is so large it is difficult for anyone to grasp what is going on in all the regions at any given time. Yet the markets seem to be very efficient at distributing information resulting in symmetric prices throughout Empire space (and even further). 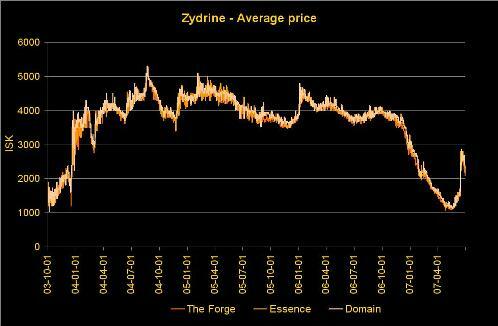 This is clearly visible in figure 11 which shows the price for zydrine [one of the more valuable minerals that is used for manufacturing in game] in three different Empire regions. The main way to analyze a video game economy is in terms of the one truly scarce resource: player time and effort. In Eve, in order for a player to perform arbitrage, he has to physically move the good from one place to another – thus players will only do so if the profits are worth the time spent moving the goods around. Zydrine is a relatively dense good, in terms of value per volume; a small ship can haul thousands of units of zydrine, so a 200 isk/unit price difference between regions can be exploited for millions of isk in one trip. Another mineral, Tritanium, is only worth on the order of 3-4 isk per unit; its price can be a lot more volatile, especially in uncivilized regions where a large cargo ship can be attacked and destroyed. Does anyone know of other studies done on the virtual economies in other MMOGs, casual online worlds, or social networks with virtual goods? Posted by jeremyliew in business models, economics. Techdirt, referencing Bob Lefsetz, draws an interesting parallel between the music and cellphone business models. He [Lefsetz] also highlights how the idiotic focus on getting more per song, just as everything else about music and technology gets cheaper, is hurting the record labels much more than it helps them. He compares the situation to how expensive it was to use mobile phones a dozen years ago. People were scared to use mobile phones because the charges were ridiculously high. You only used it in special circumstances. Today, however, the rates are much, much lower and that’s massively grown the market for mobile services. Do you think the mobile operators would prefer to go back to $1/minute charges? Yet, why does the recording industry insist on $1/song charges when the infrastructure can support an entirely different model. Instead, make the music cheap and easily accessible. As a general rule, in a competitive market, prices drop towards marginal cost. But if demand is elastic, then industry revenues and profits can still benefit from this. Lefsetz makes the point with far more capital letters, exclamation points and indignation in his original post.